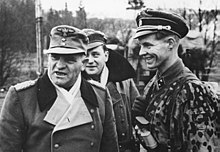 Josef "Sepp" Dietrich (May 28, 1892 in Hawangen - April 21, 1966 in Ludwigsburg) was a German Waffen-SS general, and one of the closest men to Adolf Hitler. For his wartime services, he was one of only 27 men to be awarded the Knight's Cross with Oak leaves, Swords and Diamonds. Dietrich and other members of the Waffen-SS were tried for war crimes after WW2. This page was last changed on 15 September 2017, at 11:44.